Debenhams leverages the voice of the customer by embracing four CGC maxims and using them as the foundation of their winning strategy, resulting in an increase in conversion, successful product launches and impactful shopper engagement. Maximize the impact of CGC. Leverage Bazaarvoice Syndication, Sampling, and Curations to deliver on the global retailer’s digital objectives. Increase in CGC volume, lift in conversion, successful product launches and more engagement with shoppers. Site visitors who interacted with reviews syndicated from Lancôme showed an average of 30% increase in conversion. If you’re wondering how a global retailer uses consumer-generated content (CGC) to fuel growth, look no further than Debenhams. With a global base of online customers and more than 240 stores across 27 countries, Debenhams is a major retailer of designer apparel, household, and other products — and one of the most successful at using the voice of the customer to sustain growth and help other shoppers make smart buying decisions. How does Debenhams leverage the voice of the customer? They embrace four CGC maxims and use them as the foundation of their winning strategy, resulting in an increase in conversion, successful product launches and impactful shopper engagement. Accessing a network of opinion, conversation, and information, today’s consumer leverages a wealth of knowledge to guide their purchases. Embracing the opportunity presented by the network, Debenhams uses the voice of its customers to join the conversations and help other shoppers make smart buying decisions. We strive to drive and leverage consumer-driven content to add value for both the business and our customers, whilst maintaining quality reflective of the Debenhams brand, says Carly Hounsell, Product Review Coordinator at Debenhams. Ratings, reviews, and customer photos on the retailer’s site deliver a strong shopping experience and drive sales. Across the Bazaarvoice Network, shoppers who interact with CGC on retail sites are 106% more likely to convert and experience an average 116% lift in revenue per visitor. The days of linear shopper journeys are over. With the rise of omnichannel, the blend of in-store, online, and mobile shopping, extends the reach of CGC and ensures companies find customers wherever they are. Content syndication offers brands and retailers a quick and easy way to extend the reach of their CGC. Debenhams has gathered and displayed more than 760,000 total reviews across thousands of products, and a significant portion comes from more than 800 brands that syndicate their consumer content to the retailer site. We know that reviews instill trust in our customers, fill in knowledge gaps, and strengthen their intent to purchase, says Nikki Watson, Head of Optimization at Debenhams. With so many of our brands already part of the Bazaarvoice Network, making the most of the content already out there was a really simple process. The influx of reviews has contributed to a significant increase in conversion. While ensuring we are connecting with shoppers and assisting with their purchase decisions, instilling trust is always driving our efforts with customer reviews, says Hounsell. Conversion is also a key metric we are looking to increase, and our analytics show that products with more reviews experience a higher level of conversion. This is true across a wide range of products and categories. For example, Debenhams has amassed more than 3,000 reviews from Lancôme since enabling inbound syndication from the beauty brand. Visitors to the site who interacted with these reviews showed an average of 30% increase in conversion. Syndication has been a really useful tool. It enables us to distribute content from consumers who are already advocates of the brands we stock to our own product pages, resulting in a boost in product coverage and a positive increase in conversion, says Watson. Along with ratings and reviews, today’s shoppers seek visual content to inform and validate their purchase decisions. Social content in the form of photos and videos forges emotional connections with customers and helps turn everyday consumers into advocates. Debenhams successfully addresses this consumer demand. Selected as the exclusive retailer in the UK for the Kat Von D makeup brand, Debenhams sought to launch the product line with reviews and photos from customers already in place. Debenhams used Bazaarvoice Sampling to send samples and collect reviews from brand advocates. The sampling campaign helped us launch the brand along with really strong and honest reviews, says Hounsell. Reviewers provided really constructive and lengthy feedback, which we know is a big factor in conversion. Debenhams also used Bazaarvoice Curations to support the brand launch. The company collected and displayed more than 900 photos from customers on product detail pages and as a shoppable gallery as the products became available on the site. The visual content resonates with shoppers, as more than 25,000 visitors interacted with the shoppable gallery within the first two months. 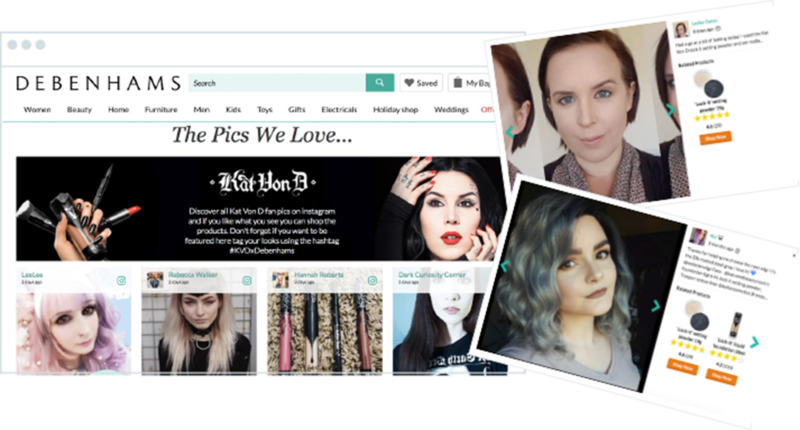 Kat Von D is a brand with a big following already, and Curations enabled us to utilize this enthusiasm and pull great, engaging consumer-generated content into the brand launch pages from day one, says Hounsell. This provides us with an extra dimension to our product pages and offers new customers a trusted visual source to inspire them. Following the success of the launch, Debenhams plans to continue leveraging consumer-generated reviews and photos when adding new brands or product lines. Savvy marketers know that CGC is more than a conversion tool. It is insightful, fresh, and targeted customer feedback that can be mined to support other parts of the organization. 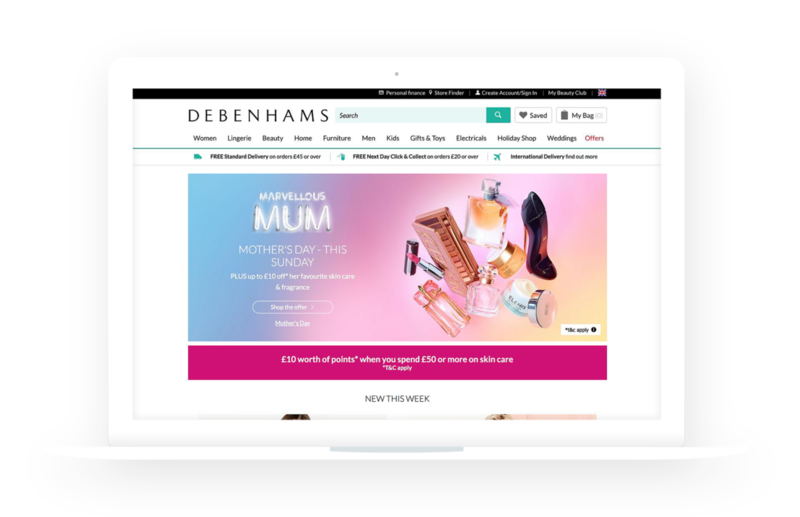 Debenhams uses the review submission form to ask relevant questions based on the product and category and displays those review attributes, steering reviewers to offer useful information for other shoppers. If we’re asking a customer to rate makeup, we don’t want to ask them how it fits or the style. We want to know their skin type, ease of application, how long it lasts, and those sorts of relevant pieces of information, Hounsell explains. Customers can then use these attributes to find the reviews from people most like them, which provides a higher-impact personalized shopping experience. Various departments within the company receive automated reports from the consumer-generated content program, giving them visibility into any issues and the ability to engage with customers. For example, when Debenhams’ Home and Furniture team noticed an influx of negative reviews around couch cushions losing their shape, the team responded publicly to the reviews and sent replacement cushions to those customers. Debenhams then worked with the manufacturer to fix the issue and updated the product description. These actions successfully halted the negative reviews and quickly restored the product’s previous high rating. Debenhams recognizes that consumers are more empowered than ever before and are connected to a world of information, including the opinions of other shoppers. By incorporating CGC into its digital strategy, Debenhams proves the value of customer-centricity and provides shoppers with the information they want. Debenhams is a leading international department store with more than 240 stores across 27 countries. The fashion retailer offers a mix of clothing, shoes, accessories, cosmetics, home and furniture and other products. We know that reviews instill trust in our customers, fill in knowledge gaps, and strengthen their intent to purchase. DSW uses Bazaarvoice Curations to provide online shoppers with the visual style guidance they experience in stores. Let Bazaarvoice help you command your goals and catapult your business.